I had some guests over for lunch. 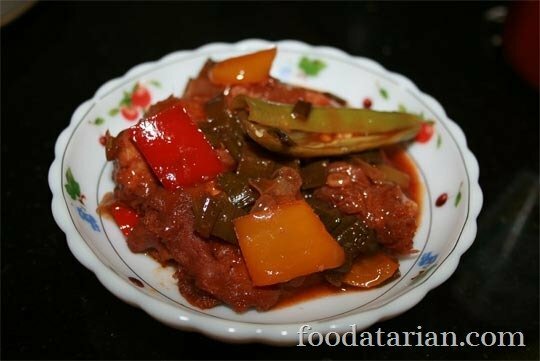 My husband suggested me to prepare a chicken recipe that is not a usual curry recipe. But since I was serving rice, I thought of experimenting bit with the usual honey chicken recipe. Chilli Honey Chicken is a chicken recipe where boneless chicken pieces are marinated with soy and chilli sauce, egg, salt and corn flour. Later deep fried and dropped into a thick sauce with scallions, peppers and mushrooms seasoned with salt, pepper, soy sauce, chilli sauce, fresh green chillies, honey and vinegar. Serve over rice or noodles. Some water for the gravy. 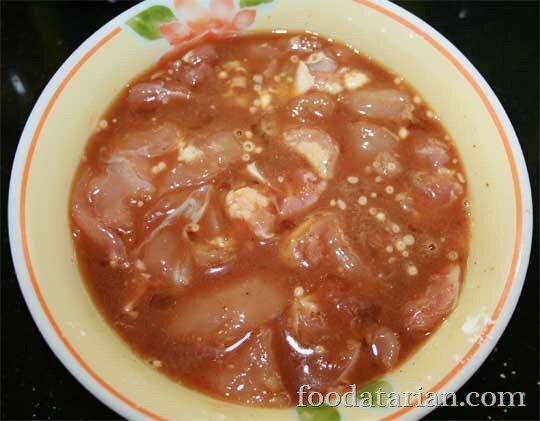 Mix all the ingredients for marinade (except corn flour) and add chicken chunks to it. Slowly add corn flour to prepare a thick batter and let it coat all over the chicken pieces. Let this marinate for around 1 hour in the refrigerator. Later heat vegetable oil for deep frying in a wok. The oil should not be smoking hot. 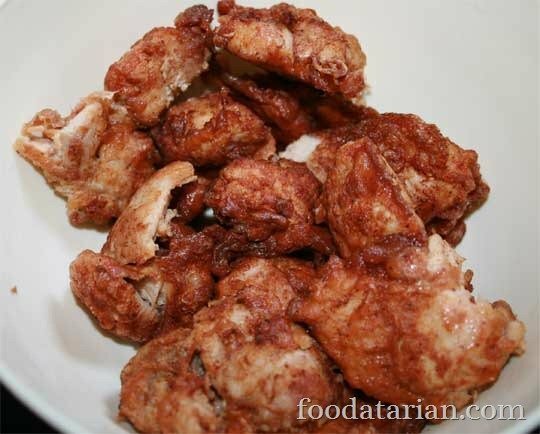 Then add marinated chicken chunks in batches and fry at a golden-brown color. Drain on paper towels. Heat some olive oil in a pan. Add garlic and sauté until just fragrant. Then add onions and sauté for a minute. 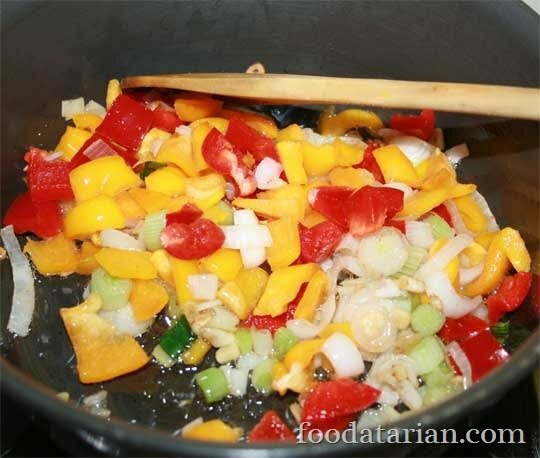 Then add peppers and mushrooms and stir fry for few minutes. Then add scallion greens and stir fry. Now add soy sauce, chilli sauce, tomato ketchup, salt, honey, some water (according to your requirement of gravy) and bring to boil. 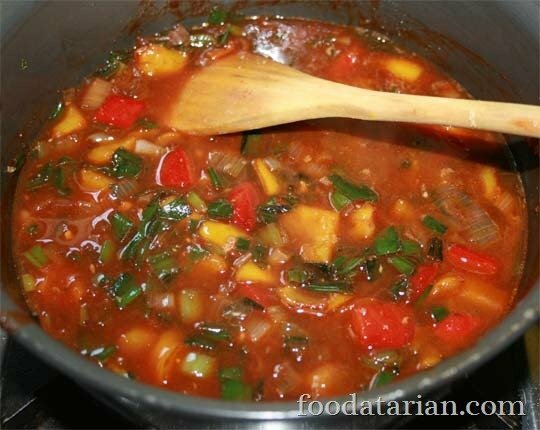 Add vinegar, corn flour paste, stir and remove from flame. Slurp,thats a droolworthy chilly honey chicken,inviting!